Economists (not econometricians, actual economists who study the economy) like to talk about the world in a very abstract way. Even saying "The Economy", implies that it's a thing on its own, rather than the total of lots of people working at their jobs, and then using the money they make to buy food and iPhones. Classical economic theory is full of abstract summaries that try their very best to ignore that they're dealing with real people. Economic Rational Man, the foundation of so much economic theory is essentially an assumption that people will behave like economists want them to, rather than as they actually do. So here's a small attempt to inject some humanity into the ISLM model (which has been hanging around since 1936.) What happens when we temporarily* depart from that happy little cross in the middle, where we're supposed to be? 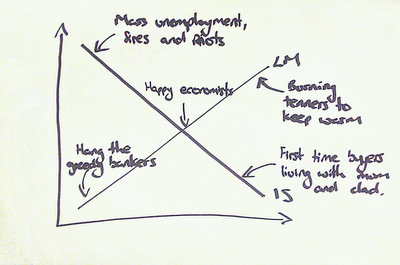 If you haven't studied economics, don't worry. 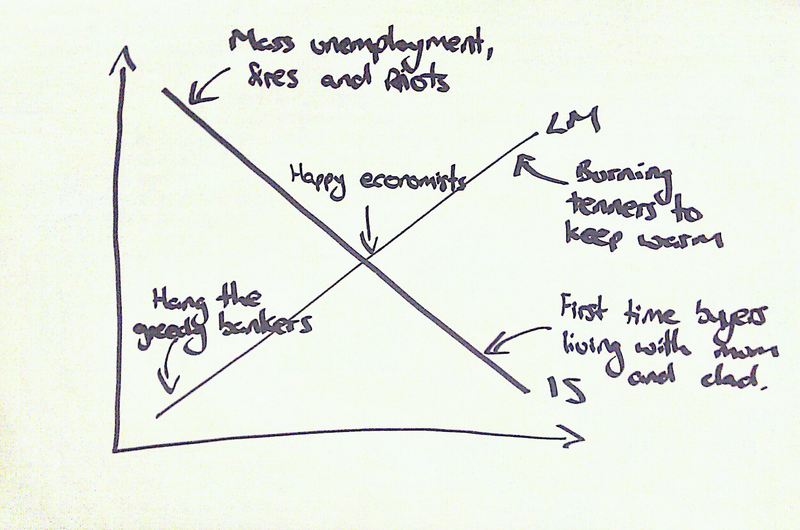 LM is the money market and IS is the bit of the economy that actually makes things and all you need to know is that economists love a cross on a chart with a list of good reasons why things will find their way to the middle of the cross on their own, if politicians don't fiddle with them. * It's always a temporary departure, but economists are very good at avoiding questions about how long temporarily is. As in "How long is this temporary 15% unemployment going to last, before the free market kicks in a re-stabilises everything?"